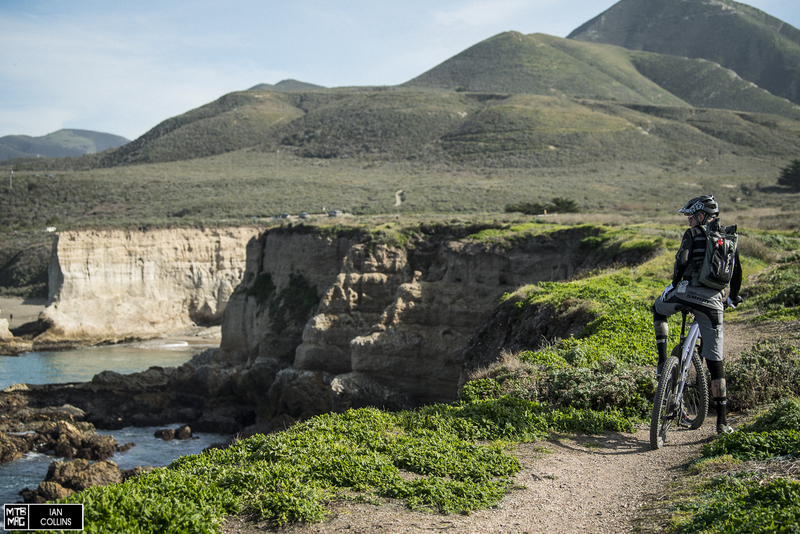 I recently made a two hour jaunt South to SRAM’s California office in San Luis Obispo, for my first ride aboard their new AXS components. 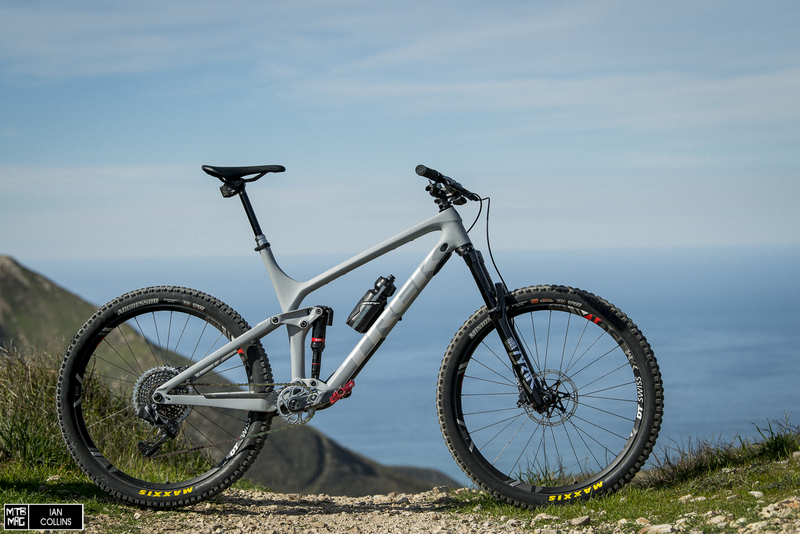 Over the last few months we’ve seen spy pics of Nino Schurter and Emily Batty aboard pre-production versions of an electronic shifting system and a dropper post. 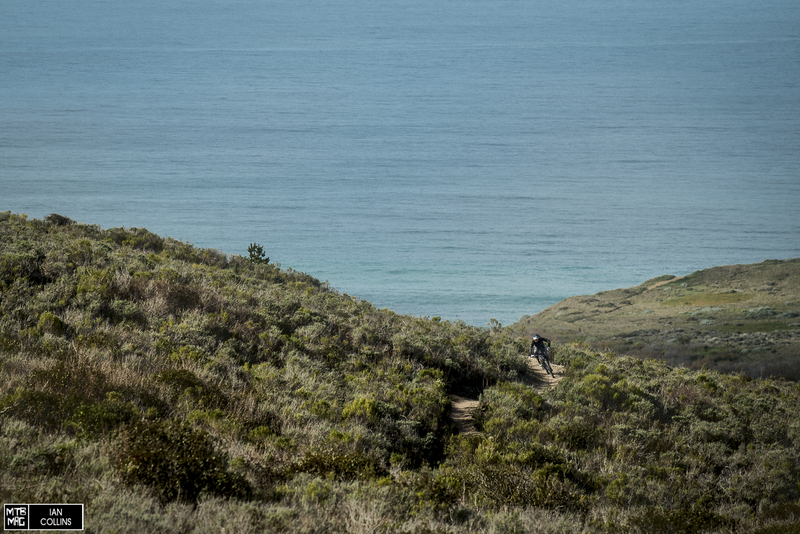 Now that these bits are just a couple months away from being available to consumers, SRAM invited us out for a preview of them on the beautiful Montana De Oro trail network, perched above the Pacific Ocean, just a few miles from their office. The drivetrain above should look somewhat familiar, because it is. While XX1/XO1 Eagle AXS parts(aside from the shifter and derailleur) get new color treatments, the drivetrain parts such as chain, cassette, chainring and cranks remain unchanged. We rode the “Enduro focused” XO1 group, which sees slightly less dramatic attempts at weight loss. 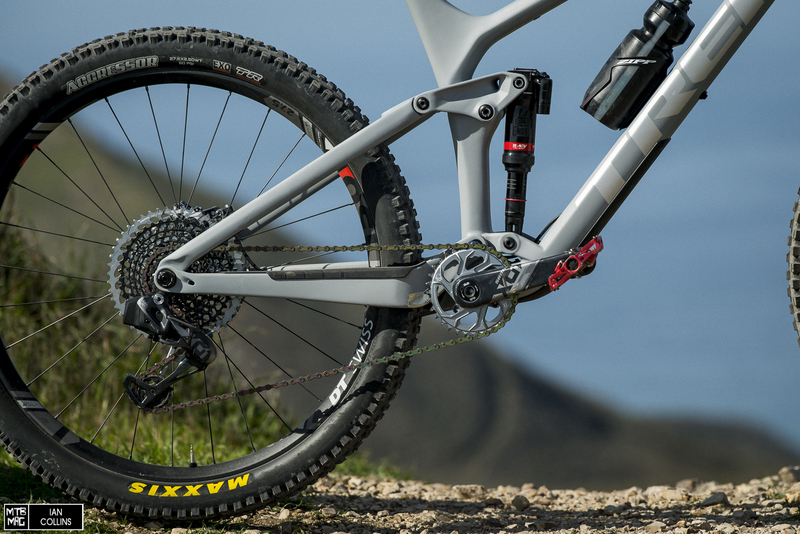 Its flagship XC counterpart sees titanium hardware and a carbon fiber pulley cage. The installation and setup is surprisingly easy. You adjust your high and low limit screws and set your B-tension using an included gauge, just like a mechanical Eagle derailleur. Then, via the controller, you can micro adjust “trim” (in lieu of cable tension) in increments that appear to be around 1mm, by holding down on a button on the controller, and pressing the paddle up or down, depending on which direction you’re trying to move the derailleur toward. From an ergonomic standpoint, the controller is brilliant. There is a single paddle that you tap up or down with your thumb. Via the AXS app, you can decide if up shifts up and down shifts down, or vice versa. You can even assign the shifter to control your Reverb. There’s also the “Secret Sprint” paddle, which you can see being actuated in the video. Basically, when you’re standing up and sprinting, your hand is in a pretty natural position to shift with your index finger’s knuckle. The controller is shown above with a standard clamp, but rest assured, it’s Matchmaker compatible. The AXS derailleur seemed a bit beefier than its past counterparts, and everything is nicely streamlined, featuring smooth, clean lines. This is ideal not only as a matter of aesthetic appeal, but functionally, it should help prevent encounters with trailside nuisances. SRAM incorporated a really interesting impact protection feature. Basically, when an object strikes the derailleur, the Overload clutch disengages to allow the derailleur to move away from the impact, thus protecting the shift motor. We saw it in action and it was quite impressive; you can see it at the 2:55 mark here. An indicator light is featured on the derailleur itself, which shows battery life, which is good for about 20 hours of actual usage. Green means full or close to full charge. A constant Red means the battery is halfway, and blinking Red means you should charge or swap out the battery ASAP. The battery is attached at the back, making it less in harm’s way. Speaking of clearance, SRAM managed to shorten the derailleur’s cage by 10mm compared to the mechanical Eagle offerings. 10mm might not sound like a lot, but every bit helps in terms of protecting your pricey assets. Lastly, the battery itself is easily installed/removed with a simple latch. 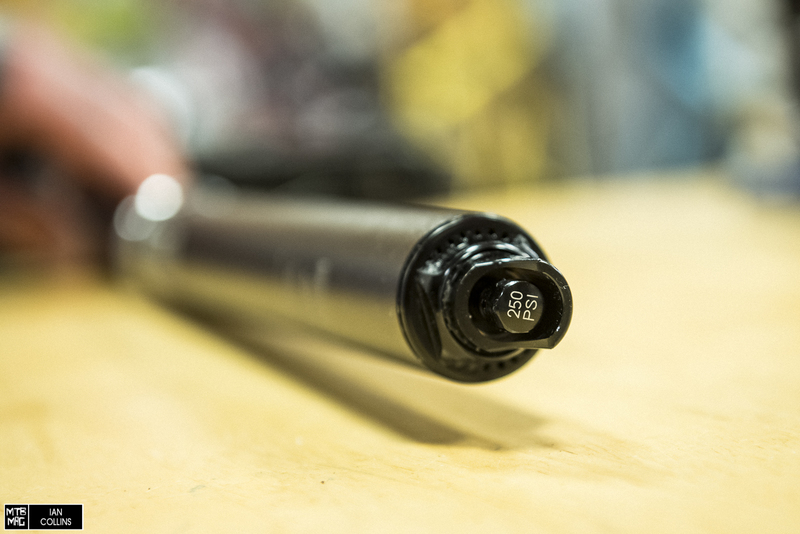 Aside from the lack of hose, and an all new head, the RockShox Reverb AXS uses a great deal of the architecture from the current, mechanical Reverb seatpost. Much like the derailleur, the battery attaches at the back, and as mentioned prior, it’s cross compatible. Since AXS simply needs to open and close a valve to actuate the Reverb, and doesn’t need to use a motor for push/force gears across space, the battery will last closer to 40 hours of usage, which is about 2X as long. The AXS Reverb controller uses a similar, but much smaller, flatter paddle that you press with your thumb. It has a very short throw, but a distinct, positive feel. It also features Matchmaker compatibility and uses a CR2032 battery. In my opinion, one of the cooler, less talked about parts of the new AXS Reverb is its head’s functionality. To adjust saddle rail fore/aft, you simply loosen the clamps with one key. Once you’ve done this, you can independently adjust the tilt with a T25 torx key at the front. It’s blazing fast to use and very secure. One hidden feature on the AXS Reverb is the “Vent Valve Technology”. Basically, it’s inevitable that air and oil will mix at times in a seatpost, which can cause that dreaded mushy feel. 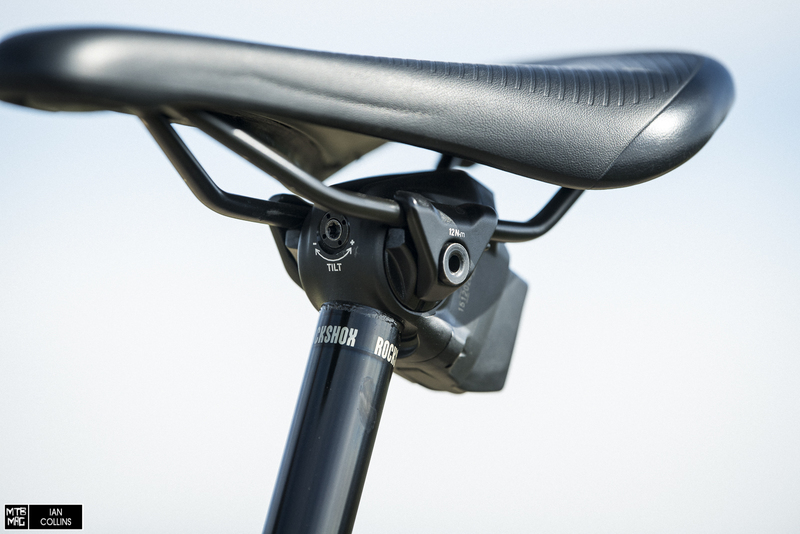 To force the air and oil to separate, you pull the seat and post as a single unit out of your bike, then by pressing on the valve on the ground, compress the seatpost. Once it returns to full extension, the air and oil will have separated, effectively re-bleeding the system and purging the air from the oil. Last, but not least – as legendary as it is, the mechanical Reverb didn’t have the best reputation in cold weather. I have a hunch that by ditching the hydraulic lever and hose, the system is less prone to being affected by temperature swings, but we’ll have to see. More importantly, thanks to a lower friction internal floating piston and a new lubrication design, there is less force required to move the saddle downward, and return speed as faster than past models. 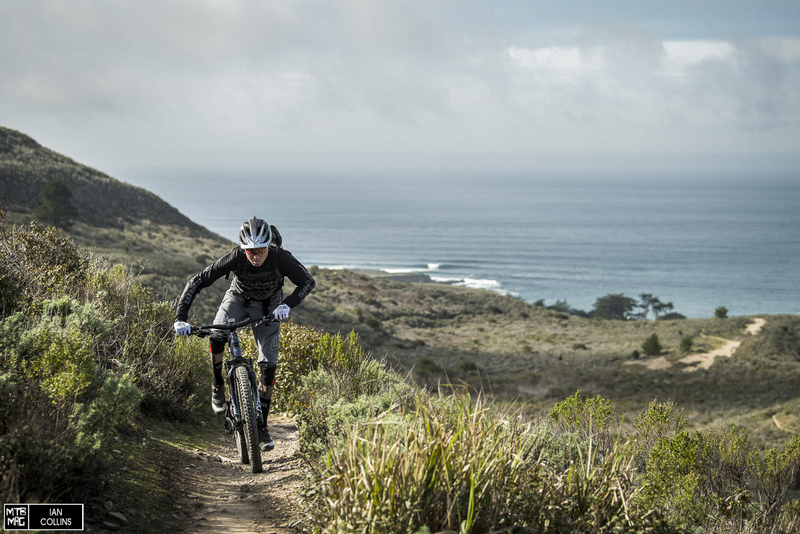 The Montana De Oro trails served as a nice initial testing ground for AXS. 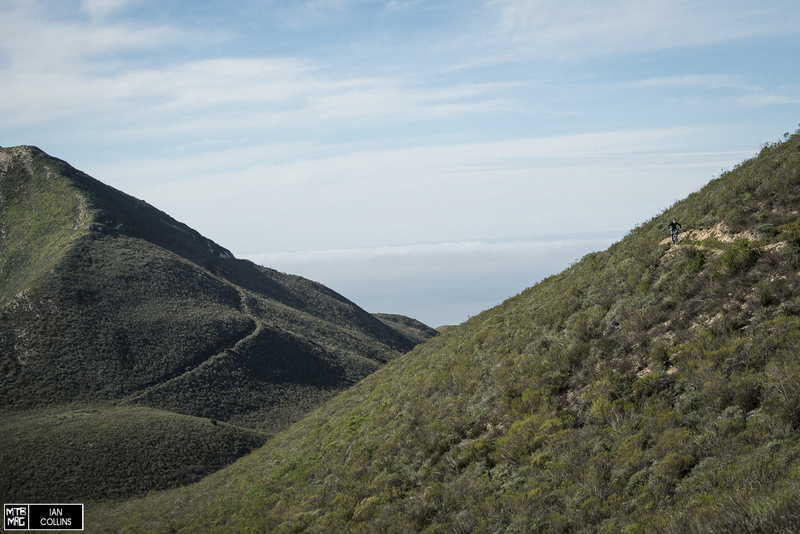 Starting right at a beautiful stretch of Central California coastline, relatively smooth, traversing singletrack threads a picturesque ribbon up through mountains that seem to jut right out of the water. The terrain itself wasn’t all that technical, which allowed me to really focus on the functionality of the new parts. With that in mind, the trails threw sharp turns at us and did undulate quite often in terms of pitch. 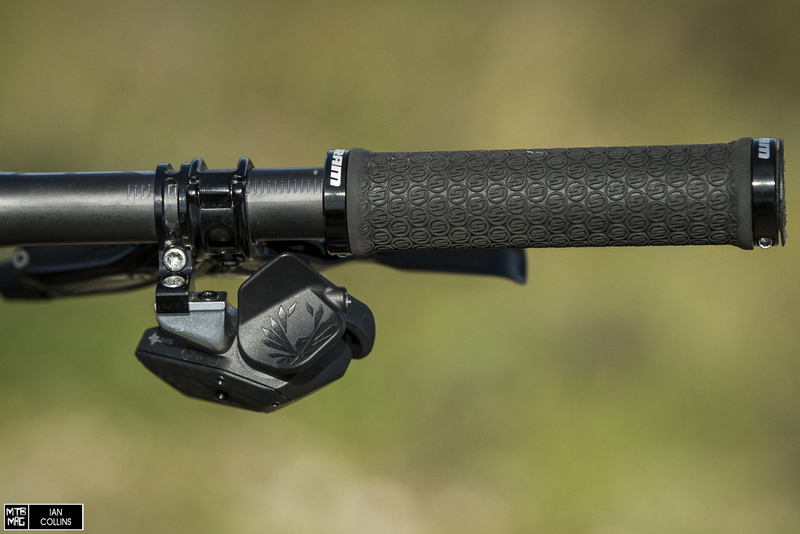 Both of these factors lead to a great deal of dropper usage and shifting. 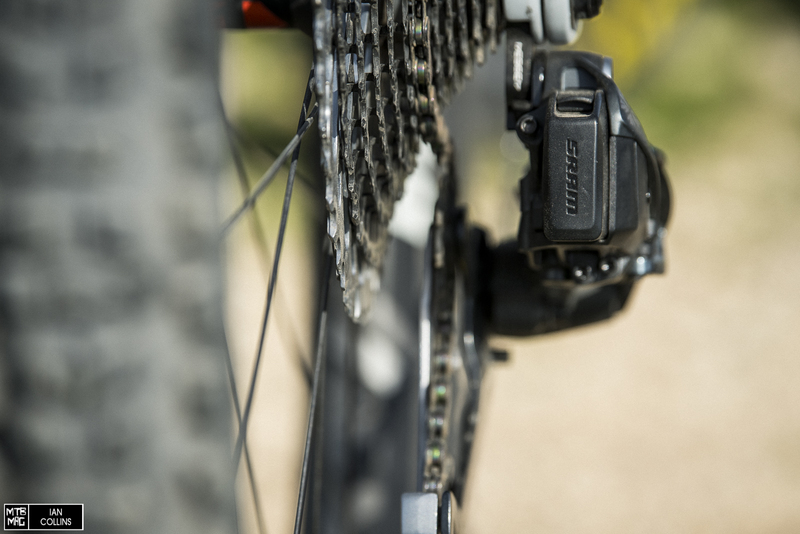 If you aren’t familiar with SRAM’s Eagle drivetrains, they’re a wide (500%) range system with just a single front chainring mated to 12 gears out back. It’s been very successful at delivering a massive amount of gearing, combined in a lighter, simpler package at a broad array of pricepoints. 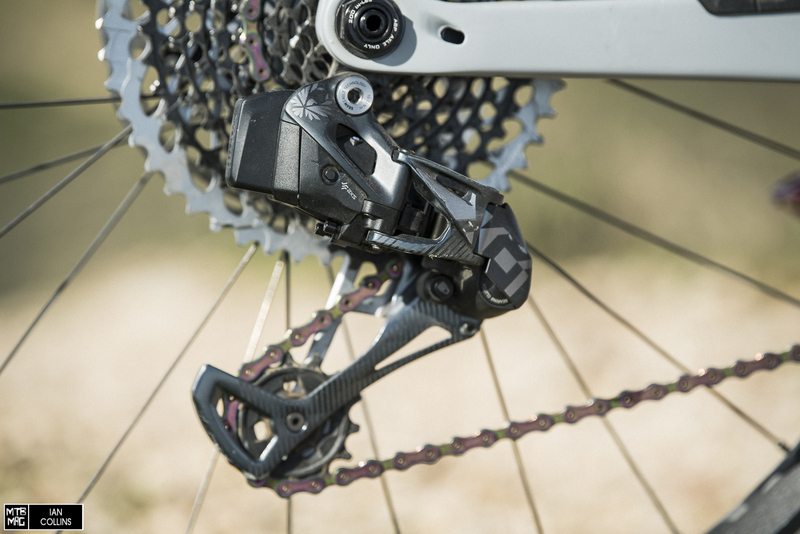 In short, Eagle is the backbone of the drivetrain being tested here, but now with an electronic shifter and derailleur. In stock form, pressing up on the controller’s shift paddle moves the chain down into smaller gears and conversely, pressing down moves the chain up. To me that seemed counter-intuitive and I just couldn’t get past it. Not to worry, as it took a mere 30 seconds to reverse on the AXS smartphone app. 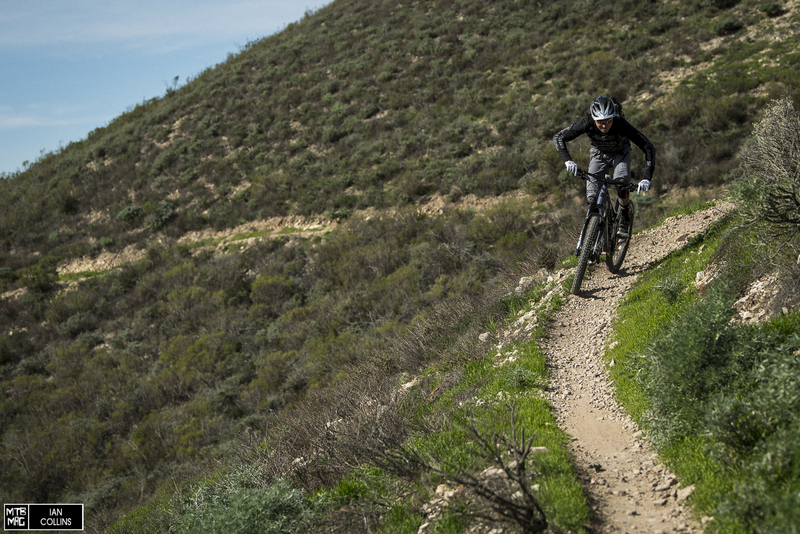 Moving on, I’ll just come out and say it – the shifting was far and away the most spot on that I’ve ever ridden. Mechanical Eagle drivetrains are a bit on the fussy side in terms of setup, but when set up perfectly, they shift incredibly well. However, something to consider is that they have more vulnerabilities than the new electronic system. Some examples are: worn or poorly lubricated cable housing or a gunked up cable pulley wheel. Heck, some bikes have a less than ideal cable routing, which can cause added friction that doesn’t allow the derailleur to always end up in precisely the right spot. The point is, removing the cable allows for more accurate shifting. What really struck me was how effortless the shifting is. After riding everything from friction shifters to Gripshift and beyond for the last 30 years of my life, it’s just second nature to be walking the line of forcefully mashing a shift lever and trying to carefully pedal in a manner that coalesces the chain into the right place. Well, that is simply no longer a factor and after some time, as I got used to it, I found myself shifting far more often because of that. Here’s another neat thing…You know how it requires some extra umpf to take your average wide range drivetrain into the largest cog? You can kiss that goodbye – it’s absolutely effortless with Eagle AXS and feels no different than any other shift. You’re probably wondering how AXS handles shifting multiple gears. Well, first off, on the smartphone app, you have a wide range of customization available at your fingertips. You can set the amount of gears that will shift (when holding down on the paddle) in order to shift 2,3 or even continuous gears at once. Should you prefer, you can also just set the controller to only allow for single shifts at a time. In any case, banging through the gears has never been smoother and faster. Moving on to the Reverb AXS dropper seatpost. I got to take advantage of the longest travel, 170mm offering. With a 33″-ish inseam, I’ll take all the travel I can get. The thumb paddle which activates the post is just the right size. It also feels great, ergonomically. Much like the shift controller’s paddle, it has a very short throw (2-3mm, I’d estimate) and absolutely no lag. To raise or lower the seat, you have to press and hold down. This keeps the valve open, but as soon as you release it closes immediately. Compared to just about any mechanical post, there was one “feature” that I truly became fond. When you give the paddle a quick tap while seated, it drops a few millimeters. Since the travel is infinite and not indexed, the amount of drop depends on how long you tap the lever for. This was quite handy when say, in the middle of a climb you encounter a technical little punch and need to quickly just get the seat down and a bit more out of the way. 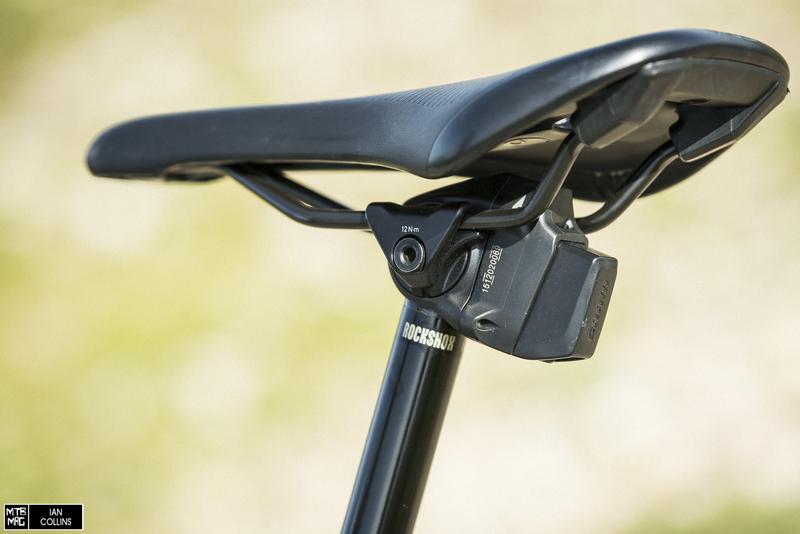 Aside from the aforementioned, we did feel that there was a discernible amount of improvement in the action of the seatpost as it not only dropped with more ease but also rebounded faster. We’ll be receiving an AXS Reverb for long term testing in the near future, so we’ll report back after seeing how it handles cold weather. Looking at AXS as an overarching technology, I think it’s safe to say that it will be a rather huge success, even after the limited time I’ve spent on it. I’ll have to get in more saddle time before it’s fair to judge its battery life, durability, performance in adverse conditions, etc. 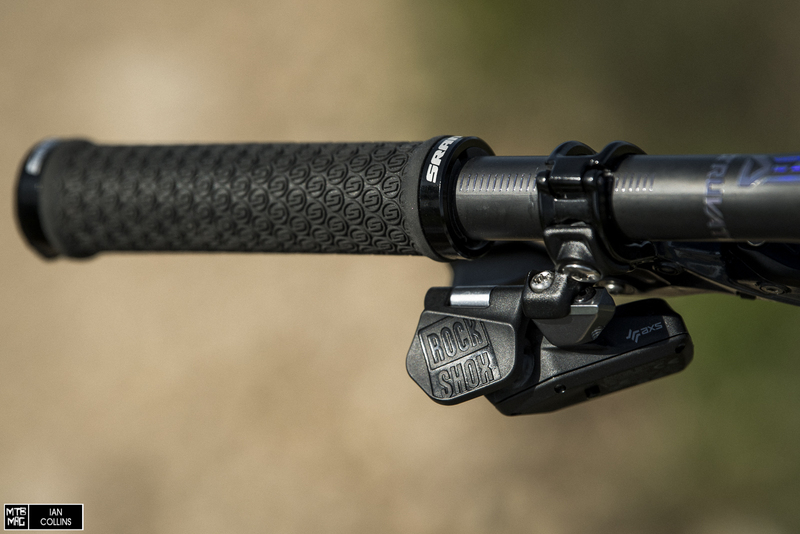 At the drivetrain in particular, AXS is a huge win in terms of ergonomics, streamlining/simplifying a bike (both mechanically and aesthetically), and above all – shifting performance. The same notions can be applied to the AXS Reverb, if you substitute shifting performance for actuation. While SRAM did a great job with keeping the AXS app and its implementation of customization both simple and intuitive, we commend their decision to keep the phone separate from the actual riding experience. In terms of cost, coming in at around $2,000 US, despite being a flagship product, I think that the XX1 Eagle AXS drivetrain is fairly reasonably priced. In all honesty, I anticipated it costing more. With that said, at $800, the Reverb seems a bit pricey though. One thing to consider is that this drivetrain is modular, and thus you have the option to mix and match within the Eagle drivetrain world. You don’t have to buy a complete flagship drivetrain. If AXS appeals to you but you’re on a budget, consider the fact that you could pair up a GX cassette and cranks with an Eagle AXS controller and derailleur and save over $600 on the price of getting into electronic shifting. One thing I’m sure of is that like all things SRAM related, this technology will come to the masses sooner than you’d expect.